Happy New Year, friends! We're back from our much needed break and excited to jump into 2017 with all of you. I'll admit, we hoped to get a lot of work done over the last two weeks, but it's hard with snuggly kitties and a Harry Potter movie marathon calling your name. 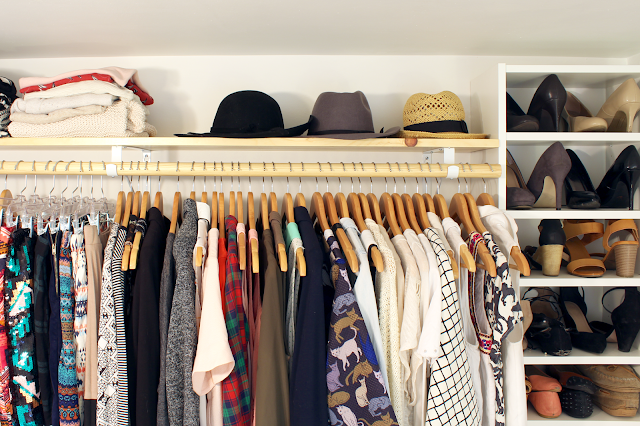 We did, however, start and finish one project I'm really excited about - a closet makeover! 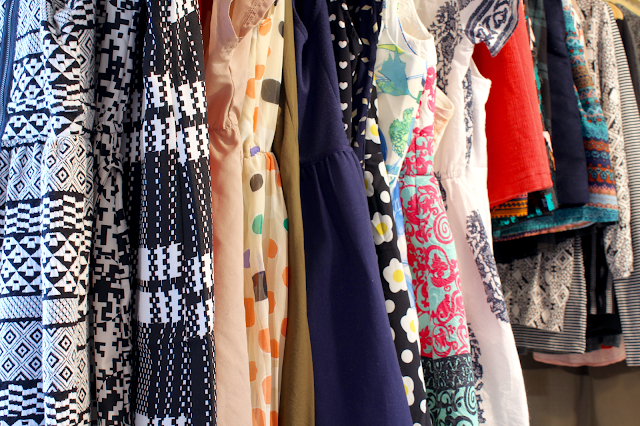 You've perhaps noticed less outfit posts on the blog the past few months. I've been feeling in a weird place with fashion - not sure if I like my current wardrobe, not sure what style I want to achieve, not feeling good about the way a lot of my clothes are fitting me. I decided to do a huge wardrobe purge and donated over 100 items from my closet. All that remains are items that I like and actually wear, which is a good start. 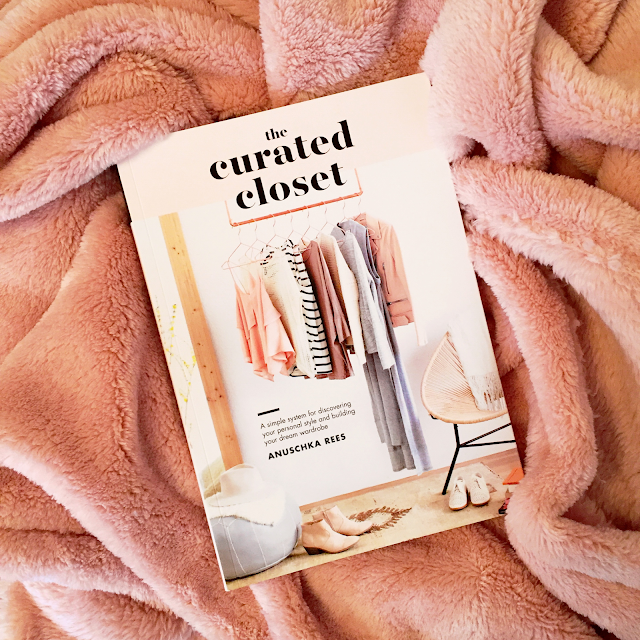 To take things a step further, I'm also reading The Curated Closet by Anuschka Rees. 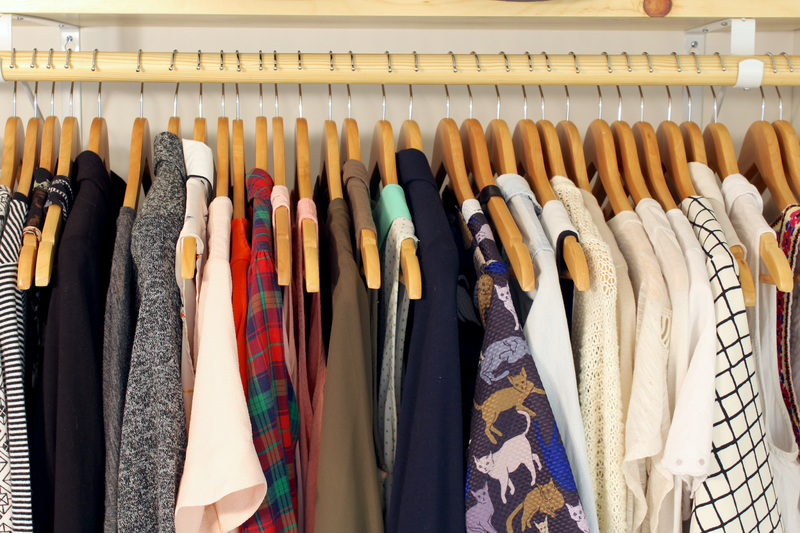 In short, it's kind of a step-by-step guide to help you find your personal style and build a quality wardrobe with items that will last for years. I'm not very far into the book yet (and there's actually work involved, like documenting what I wear), so I'll share a full review in our monthly reads when I'm done. For now though, I'm enjoying having a smaller closet to sift through and am excited to put together outfits with the pieces I decided to keep. 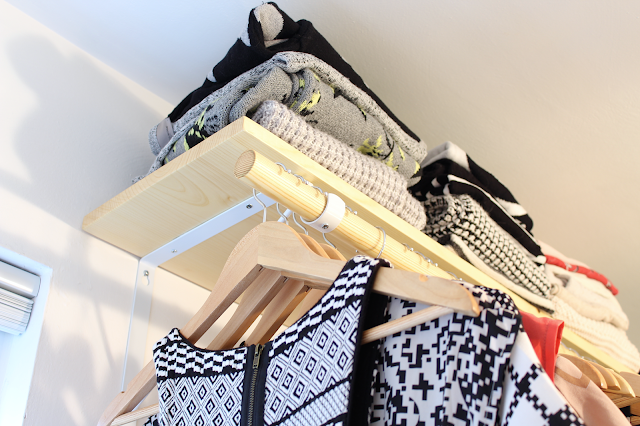 In addition to downsizing my closet, you may have noticed that it also relocated! When we moved into our house, we had always planned to build an open closet system in the guest bedroom. Our plans took a backseat to bigger projects, like the music room and basement renovation, but with time off work and a smaller closet to work with, we tackled it last week and I'm truly in love. We started by putting an IKEA Billy bookcase in the corner of the room to use as a shoe shelf. We added an extender and about 4-5 extra shelves to fit all of my shoes, and so far it's been great having easy access to all of my shoes in one place. Next to that we had about 6 feet of space to hang the closet. We went to Home Depot and bought three heavy duty shelf brackets with rod supports, a 6' pine board, and a 6' wooden dowel rod. Nick sanded the pine board and dowel, added a coat of polyurethane (already on hand from this project), and then repeated that process two more times. Once the polyurethane was fully dried and had time some to cure, we attached the brackets to the wall using wall anchors and screws, and then screwed the shelf and rod into the brackets. All in, we spent about $35 - not too bad! I even upgraded my black, plastic hangers to these wooden hangers from Amazon (30 for $23) and I think they make a huge visual impact. I also went back to my old trick of hanging all my clothes up backwards so that as I wear and wash an item, I can hang it up forwards and see what's not being worn. In 6 months or so I'll go through my closet again and get rid of unworn items. This is just a first step in figuring out my style and having less, and I hope that The Curated Closet can help me take things to the next level. 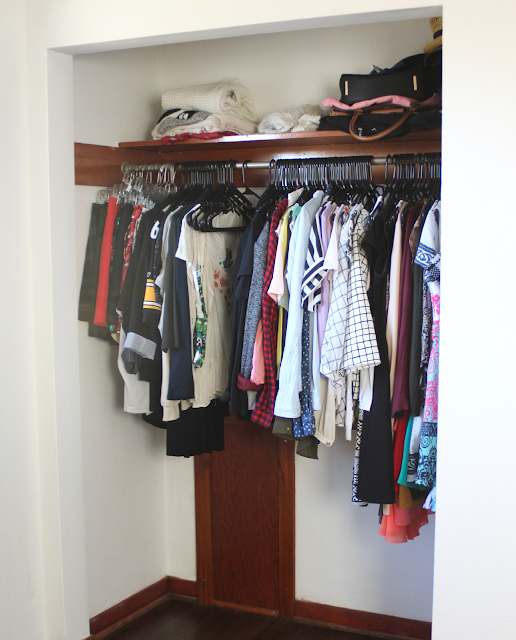 Regardless, I feel good starting a new year with a fresh closet. 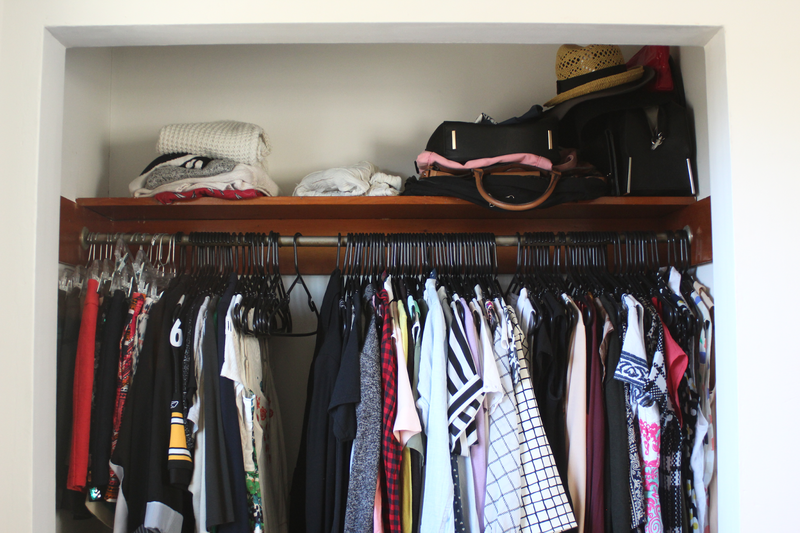 Is anyone else downsizing their wardrobe for 2017? Share with us in the comments below! Love the open closet system! i love that you guys are team ikea! because they definitely get a bad rep.
i love this!!!! 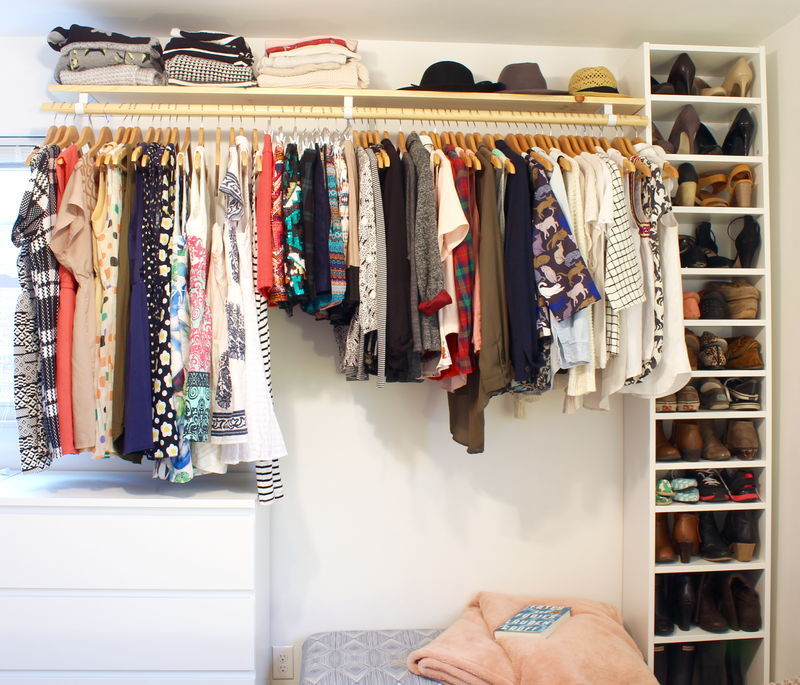 i sorta have the same kind of closet layout in my room, i just wish i would've thought about the shoe storage. Haha, we love IKEA! I have no idea why people don't like it. 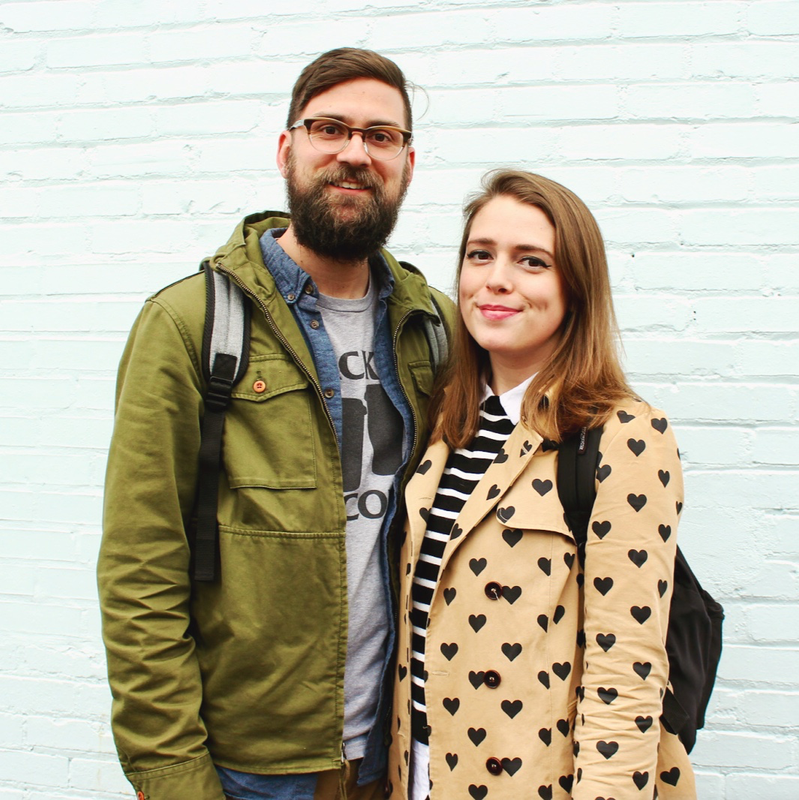 We've never felt like the furniture we bought was "cheap" or "poorly made." LOVE this! So funny because I have been struggling with my clothes exactly as you described - not liking anything, not sure what I want my style to be anymore. Thanks for the inspiration! It's such a tough place to be in once you realize it, haha! Hope we can both find our personal styles and clothes we love in 2017!